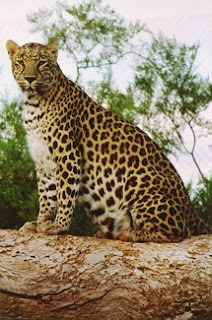 Leopards (Panthera pardus) are a rich yellow in color and covered in dark spots. Leopards are about six or seven feet in length and they weigh an average of 150 pounds. Leopards are found throughout Africa, except the deserts of Sahara and Kalahari. The Leopard can make a loud deep roar. They are keen hunters, and feed on a wide variety of food sources. They will eat insects, to rodents, to extremely large animals such as a giraffe or buffalo, monkeys, reptiles, amphibians, birds, fish, wild pigs, and ungulates, including deer. They are extremely agile, and can climb trees with ease. 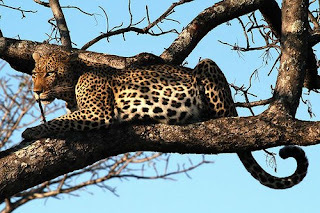 Leopard will often seek shelter in trees, and use their vantage point to survey their surroundings. Leopards hunt alone, and they do it silently. 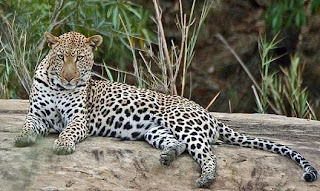 The leopard will hide itself behind plants or amongst tall grass, and silently creep closer to its prey, then hide again. Once they gain a capable distance, they will accelerate and take down their prey. Leopards are capable of carrying animals up to twice their own weight into the trees. It hunts mostly during the day but also during the night, especially if it is raiding domestic stock like cattle, goats, fowls and dogs. Sometimes a leopard will keep the balance carcass of its kill, for example a deer, hidden in a thicket. This is to eat it later when the leopard gets hungry again. However the smell of putrefying flesh attracts other carrion eaters to the kill. Sometimes the leopard will chase the intruders away but at other times, especially if it is full, will let them eat. Leopards generally have 2 or 3 cubs in a litter but infant mortality is high and mothers are generally seen with 1-2 cubs. The pregnant females find a cave, crevice among boulders, a hollow tree, or a thicket to make a den and give birth. Cubs open their eyes after 10 days. The fur of the young tend to be longer and thicker than that of adults. At about 3 months the infants begin to follow the mother about. Leopards remain with the mother for 18-24 months though they can fend for themselves earlier. The lifespan of a leopard is between 12-17 years. great technics from the leopard.